Pull stems out of chiles, and then use scissors to slice them open down length wise. Seed and de-pith the chiles, and then place them in a skillet over medium heat until darker and aromatic, about 2 – 5 minutes per side. Grind finely with kosher salt in a spice mill. We don’t have a spice mill, so we used our blender and it worked fine. Drape smooth kitchen towel over large bowl. Place chopped potatoes and 1 cup onions in food processor and blend until the mixture is very finely ground, scraping sides of bowl often. Gather towel tightly around the mixture, and then squeeze out at least one cup of liquid (but if your kitchen assistant has the strength of 20 men, tell him to tone it down a few notches so that the towel doesn’t burst – trust me). Scrape dry mixture into another bowl, and then add egg, masa, 1/2 tsp pepper, 1 1/4 tsp coarse salt, and 1 cup onions. Stir until mixture becomes moist and sticks together (the salt will draw out additional moisture, and I am not sure how the starch thing works). Heat 6 Tbsp oil in a large skillet. For each latke, drop 1 rounded tablespoon full of potato mixture into skillet; flatten to 2.5-inch diameter round, and fry until golden brown. Place on drying rack so oil can drain off. Wash and drain watercress, and remove the hard-to-chew stems. Place watercress, cilantro, mango slices, and pepitas in large bowl. Sprinkle salt, pepper, garlic powder, and chile salt all around. Cut the lime in half and move it around in a spiral over the salad, drizzling the delicious juice all around the bowl of greens (and stuff). Drizzle the vinegar and then the oil around the bowl in the same spiral patter you used for the lime. Toss the salad, and then plate it up as shown in the picture (we had a little extra after plating it up for 6, but I just put it on the table and it got eaten). Place 2 – 3 latkes on each of six plates. Place avocado slices on each plate. 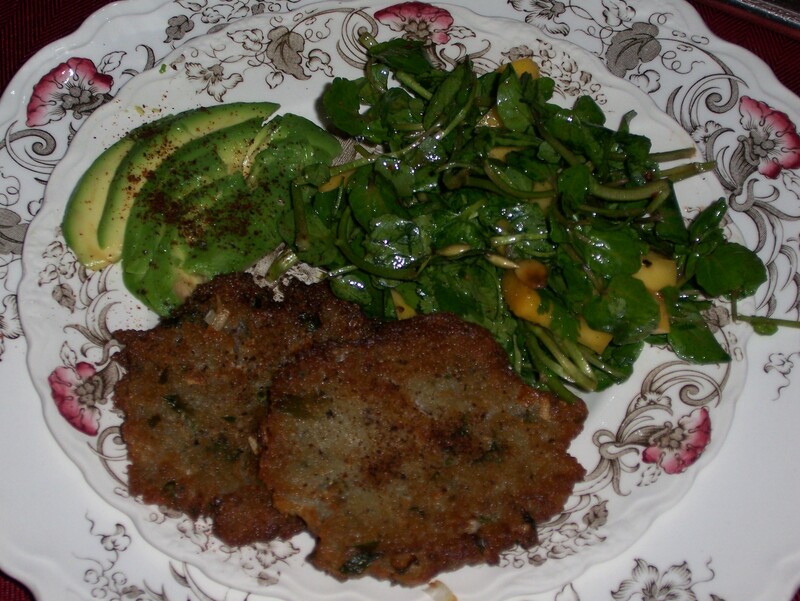 Place some watercress salad on each plate. Sprinkle chile salt over everything in an artful manner. Use a flamboyant flourish to remove any chile salt from your fingers. This will impress your guests. I swear it's not blood! It's the pomegranate chile reduction sauce and it was delicious! Obviously, I need a squeeze bottle for more precise drips and smears. Stir sugar and water together in a heavy large saucepan over medium heat until sugar dissolves. Increase heat and boil until syrup is a deep amber color, swirling pan occasionally, about 8 minutes. Add juice and broth, stirring constantly (syrup may solidify as you add the juice, but it will melt again when the mixture heats up). Boil until sauce has reduced to about 1 1/2 cups (about 25 minutes). Remove from heat; puree in a tightly covered blender until smooth, about 2 minutes. Transfer to bowl, and mix in adobo sauce, vinegar, and cumin. Season to taste with a generous amount of kosher salt and freshly ground black pepper. My dad acquired some Speedgoat steaks from a friend (well, he called them Antelope steaks – see my brother’s comment below), so I kind of planned this meal around them. 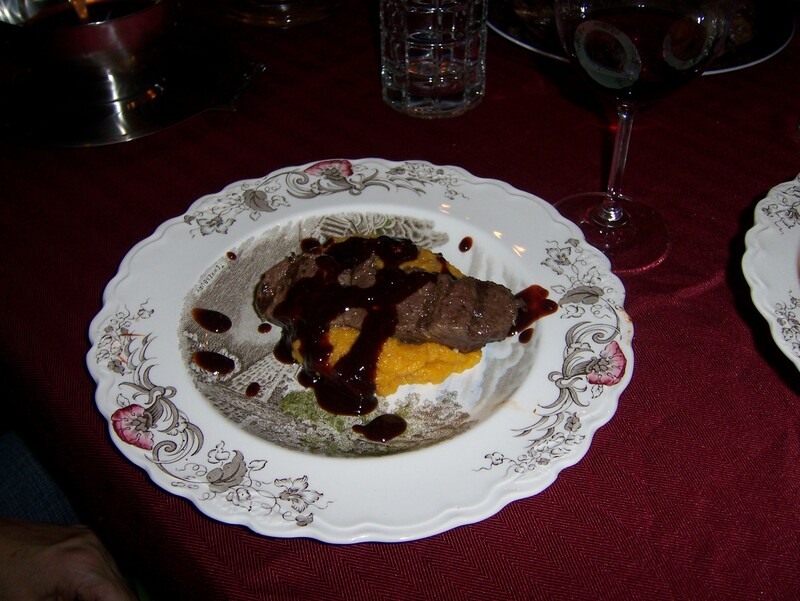 I just thought that the strong flavors from the pomegranate reduction sauce would go nicely with big game. You could substitute regular beef steaks, or buffalo, or venison – whatever you have available to you. Rub salt, pepper, and garlic onto steaks a couple of hours before grilling them. Drizzle olive oil on steaks. Grill steaks to desired done-ness. So as to avoid any fingertip burning when dissecting the squash and sweet potatoes, the first thing I did in the meal prep was to start cooking those guys. I cooked the squash in the microwave and the sweet potatoes in the oven about 3 or so hours before dinner. Cook squash, one at a time, on high in microwave until very tender, turning once, about 25 minutes per side. Cook sweet potatoes for about 30 minutes, or until quite tender. Let squash and tubers cool, and then remove skins/seeds. Puree in food processor, add allspice, butter, and kosher salt, and then transfer to baking dish. About 30 minutes before serving, heat the puree. Place some puree on a plate. Place an antelope steak on top and squish the puree with it. Drizzle pomegranate-chile reduction sauce about the plate in an artful way; this will impress your guests. Like I said, this one was a total flop (literally) – They just looked like ramekins with some stuff at the bottom. Therefore, no picture. Do NOT make these ahead of time, as Bon Appetit suggests. I think the custardy stuff would be OK to make ahead of time if you keep it at room temp, but definitely do NOT add the egg whites ahead of time. Bake immediately after you add those guys. I mean, they were still good, but they were neither light nor fluffy and that made me very sad, especially since I had my suspicions about the recipe, but since I’d never made a souffle before I figured I would follow the recipe for a change. Big mistake! Bring all ingredients to a boil in small saucepan, stirring until sugar dissolves. Reduce heat and simmer until berries are soft, about 6 minutes. Pour mixture through strainer set over bowl, pressing on solids to extract liquid. Add flour; whisk until bubbly but not brown, about 2 minutes. Gradually add the coconut milk and whisk until the mixture thickens, about 1 minute. Remove from heat and whisk in 2.5 Tbsp sugar, rum, extract, and salt. Place plastic wrap directly onto surface of mixture and bring to room temp. Butter 8 3/4-cup ramekins and coat with sugar. Place cups on rimmed baking sheet. Using electric mixer, beat egg whites until medium-stiff peaks form. Add 1/4 of whites to coconut base and whisk until lightened. Add remaining whites in 2 additions and fold in with rubber spatula. Divide mixture among prepared cups; smooth tops. Bake souffles until they are puffed and beginning to brown (about 18 minutes). Serve in ramekins with sauce drizzled over the top.